The ultimate hydrating radiance boost. This overnight mask deeply hydrates, plumps and brightens with powerful antioxidant-rich superberries and THD ascorbate, the latest clinically proven form of stable Vitamin C. This formula help to target dullness and uneven skin tone for brighter, more radiant skin. Formulated with four vital hydrators squalane, hyaluronic acid, glycerin and betaine, the Dream Mask plumps and locks in moisture to repair dehydrated skin. At night apply a layer to freshly cleansed skin before heading to bed. Follow your regular cleansing routine in the morning. Use nightly for best results. Contains a proprietary blend of superberry blend: maqui, açai, prickly pear, goji berry, sunflower, jojoba, moringa and squalane. Tip: mix a drop of Glow Oil and Superberry Mask for and added radiance boost. The texture is rich and creamy and the scent super fruity and juicy. Maqui fruit is the most antioxidant dense fruit in the world. This rare superberry helps combat free radicals. Vitamin C (THD Ascorbate) is super potent and non-irritating. Vitamin C firms and brightens the look and feel of skin. Squalane mimics your skin's natural oils to boost hydration without the risk of clogged pores. Prickly pear is extremely hydrating and helps ease the signs of redness. My experience with this mask is all positive. I apply it over my Retin A at night or without my Retin A and it gives skin a beautiful glow then next day. Glow is an understatement. The Dream Mask makes skin look hydrated and happy and just plain beautiful. The jar it comes in will last a while too. It is about 2 ounces of product you get which should last through at least 10 masks. You only need a small amount for your whole face, neck and décoletté. 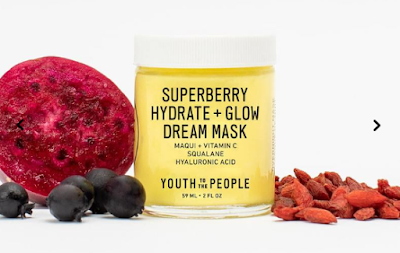 Youth to the People Superberry Hydrate + Glow Dream Mask retails for $48.00 per 2 oz./59mL of product. Like Youth To The People on Facebook: https://www.facebook.com/youthtothepeople/; Follow Youth To The People on Twitter: @youthtotheppl; Follow Youth To The People on Pinterest: https://www.pinterest.com/youthtothepeople/, Follow Youth To The People on Instagram: http://www.instagram.com/youthtothepeople and Subscribe to YouTube: https://www.youtube.com/youthtothepeople.